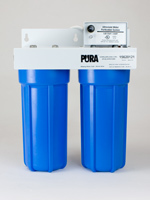 These are low-maintenance cartridge-style filters that produce quality drinking water at a fraction of the cost of bottled water. Our undersink filters are easy to maintain and last for years, quietly providing chemical-free drinking water without cluttering up the countertop. Our Black and White units use top quality, heavy-duty parts that are so tough you should never need to replace anything but the filter cartridge. 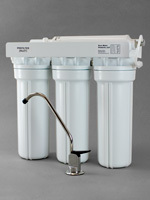 These units feature a separate ledge faucet for dispensing filtered water, ensuring maximum cartridge life. 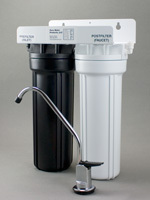 These are easy-setup filters for those who do not wish to install a separate ledge faucet for filtered water. Ultraviolet is a safe, clean, proven and easy-to-maintain method of assuring that water is free of bacteria. These units are a great choice for well water, lake and springwater, laboratories and other small commercial applications. “The World's Second Best Fluoride Remover.” Reduces fluoride by doubling the exposure to activated alumina (AAL) versus traditional fluoride systems. This is the second best treatment for fluoride after reverse osmosis, and a great choice for fluoride removal without waste water, pH alteration or mineral removal. 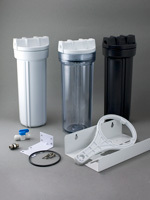 Parts for standard undersink including filter housings, brackets, faucets, fittings, tubings and more. If you have trouble identifying the parts for your unit, or if you aren't sure if a part will work for you, please give us a call or email for advice. 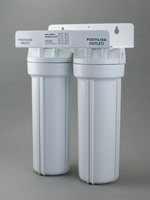 High quality replacement cartridges for all undersink units. For the Black & White and Simple Undersink units, the standard size is 2.5" x 9.75". 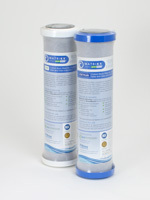 For further reading on water and water filtration, visit our Article Index.